Weber’s 1520 has been well received by customers. 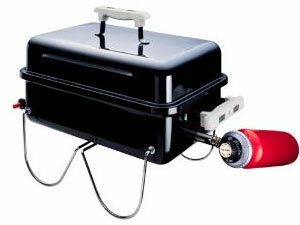 Overall, customers were impressed with the appearance of the grill, and how easy it was to set up the unit. Some customers commented that the unit had quite sharp corners, but, other than that, there were very few negatives. One problem, however, seems to be fairly common, and that is the fact the ‘Flavorizer’ bar seems to rust and lose functionality within a year. The same customers also noticed that the bottom of the unit was also beginning to rust at the same time. Following the manufacturer’s recommended maintenance schedule may address this issue. One other minor issue was that some people found the propane canisters difficult to attach to the unit, but with any new gas grill, there is a learning curve when hooking up the fuel tank or cartridge. Some customers pointed out that the push button ignition system didn’t work very well, and that the handles get very hot during cooking. It was also pointed out that there are no vents in the firebox, which rules out cooking with the lid closed. Several customers also complained about the cooking temperature distribution being so uneven that they couldn’t cook on one half of the unit. However, most customers were impressed by the speed that the grill cooks food in, and the even heat that it produces. Another concern was that, even with the lid attached as a wind-shield, the grill didn’t perform well, and, in most cases, blew out entirely even in light winds. But many customers found the opposite to be true, and, with the wind shield attached, the grill cooked food quickly and evenly. People seemed to be impressed with the speed at which the grill gets up to cooking temperature, and equally impressed at the speed at which it cools down. Another aspect of this grill that people seemed especially pleased with is how easy the unit is to clean and maintain. Overall, the comments about this unit have been very good, with people being pleased about its portability, and how easy it is to cook on, pack away, and clean up.